» ECPA, NEPA 1/27/19 Mug n Hug Joe Tesche, Vietnam Veteran Warriors' Watch Riders: WE HAVE YOUR BACKS AT HOME! 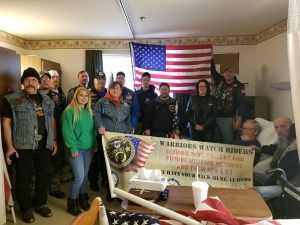 At the request of Common Ground MC, Warriors’ Watch Riders ECPA and NEPA, together with Second Brigade MC had the privilege to honor their friend Joe Tesche, a Vietnam Navy veteran fighting a serious illness at a rehabilitation center. PFC Joe Tesche served from 1970-1972. While there, we requested a list of other veterans which with the help of their staff were able to locate. All in all we honored about 15 veterans, one of them a Korean War vet and 8 other Vietnam War veterans. There wasn’t a dry eye in that whole establishment, each recipient showed a lot of emotions as well as our crew and a lot of the nursing staff that witnessed each individual presentation throughout different wings of the building. A great group effort by all involved, many patriots from different walks of life representing multiple organizations, all coming together to show honor and respect to those that sacrificed everything for our freedom. 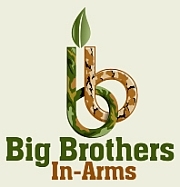 No user commented in " ECPA, NEPA 1/27/19 Mug n Hug Joe Tesche, Vietnam Veteran "